Chapter 1, Introduction to the Latest Social Media Landscape and Importance, covers the updated social media landscape and key figures. We also cover the technical environment around Python, algorithms, and social networks, which we later explain in detail. Chapter 2, Harnessing Social Data - Connecting, Capturing, and Cleaning, introduces methods to connect to the most popular social networks. 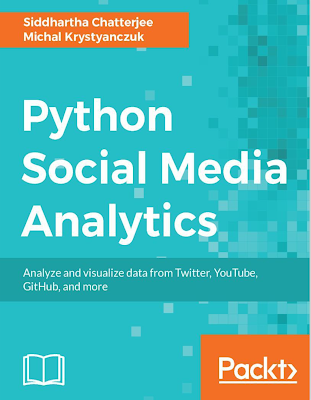 It involves the creation of developer applications on chosen social media and then using Python libraries to make connections to those applications and querying the data. We take you through the advantages and limitations of each social media platform, basic techniques to clean, structure, and normalize the data using text mining and data pre-processing. Finally, you are introduced to MongoDB and essential administration methods. Chapter 3, Uncovering Brand Activity, Emotions, and Popularity on Facebook, introduces the role of Facebook for brand activity and reputation. We will also introduce you to the Facebook API ecosystem and the methodology to extract data. You will learn the concepts of feature extraction and content analysis using keywords, hashtags, noun phrases, and verbatim extraction to derive insights from a Facebook brand page. Trend analysis on time-series data, and emotion analysis via the AlchemyAPI from IBM, are also introduced. 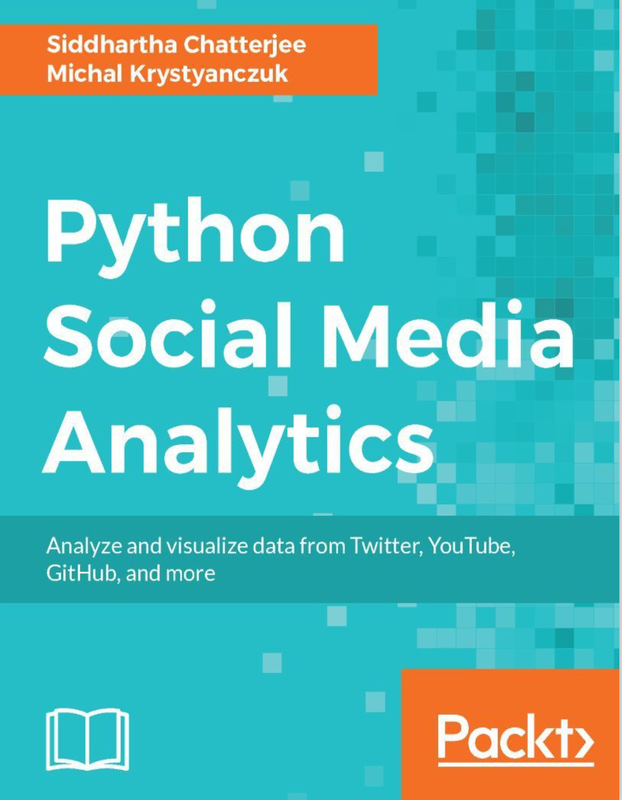 Chapter 4, Analyzing Twitter Using Sentiment Analysis and Entity Recognition, introduces you to Twitter, its uses, and the methodology to extract data using its REST and Streaming APIs using Python. You will learn to perform text mining techniques, such as stopword removal, stemming using NLTK, and more customized cleaning such as device detection. We will also introduce the concept and application of sentiment analysis using a popular Python library, VADER. This chapter will demonstrate the classification technique of machine learning to build a custom sentiment analysis algorithm. Chapter 5, Campaigns and Consumer Reaction Analytics on YouTube - Structured and Unstructured, demonstrates the analysis of both structured and unstructured data, combining the concepts we learned earlier with newer ones. We will explain the characteristics of YouTube and how campaigns and channel popularity are measured using a combination of traffic and sentiment data from user comments. This will also serve as an introduction to the Google developer platform needed to access and extract the data. Chapter 6, The Next Great Technology - Trends Mining on GitHub, introduces you to GitHub, its API, and characteristics. This chapter will demonstrate how to analyze trends on GitHub to discover projects and technologies that gather the most interest from users. We use GitHub data around repositories such as watchers, forks, and open issues to while making interesting analysis to infer the most emerging projects and technologies. Chapter 7, Scraping and Extracting Conversational Topics on Internet Forums, introduces public consumer forums with real-world examples and explains the importance of forum conversations for extracting insights about people and topics. You will learn the methodology to extract forum data using Scrapy and BeautifulSoup in Python. We'll apply the preceding techniques on a popular car forum and use Topic Models to analyze all the conversations around cars. Chapter 8, Demystifying Pinterest through Network Analysis of Users Interests, introduces an emerging and important social network, Pinterest, along with the advanced social network analysis concept of Graph Mining. Along with the Pinterest API, we will introduce the technique of advanced scraping using Selenium. You will learn to extract data from Pinterest to build a graph of pins and boards. The concepts will help you analyze and visualize the data to find the most influential topics and users on Pinterest. You will also be introduced to the concept of community detection using Python modules. Chapter 9, Social Data Analytics at Scale - Spark and Amazon Web Services, takes the reader on a tour of distributed and parallel computing. This chapter will be an introduction to implementing Spark, a popular open source cluster-computing framework. You will learn to get Python scripts ready to run at scale and execute Spark jobs on the Amazon Web Services cloud.